The Colombian Natural Gas Association reports that, during 2018, the number of public transport vehicles, trucks, dump trucks and garbage collectors dedicated to natural gas reached 800. New acquisitions were located in the Departments of Antioquia, Bolívar, Caldas and Valle del Cauca. Serving the capital city of Bogotá, TransMilenio has 2,054 articulated, biarticulated and dual buses that cover 98 services and registers about 2.5 million passport validations per day. Of the 2,054 buses 1,822 are diesel, 230 hybrids, one electric and one natural gas. That is about to change. In a massive upgrade of the fleet and replacement of aged buses, 741 articulated and bi-articulated natural gas buses are being purchased. In November 2018, Scania advised it will supply 481 Euro 6 buses for the renewal of Bogotá’s TransMilenio Bus Rapid Transit system. “The great news for Bogotá is that the city will have new buses with environmentally friendly technologies. There will be a total of 1,441 new buses that will begin arriving in Bogotá in mid-2019. 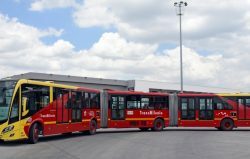 Of that figure, 741 buses will be gas with standard emission Euro VI and 700 standard diesel V Euro filter, “said the manager of TransMilenio SA , María Consuelo Araújo. “Different cities in the country, such as Bogotá, are betting on clean public transport that improves air quality; and economic, so as not to increase user fees. The award of Transmilenio showed that natural gas is a fuel that can compete with other energy thanks to its costs, and the infrastructure that already exists for transport and supply, “said Orlando Cabrales Segovia, president of Naturgas. Palmira: 50 vehicles and 15 more roll out making inter-municipal services to Cali. With the renewal of the fleet in 2019, Bogotá will have an approximate reduction of 95% of emissions of particulate material and will have an increase of 40% in the entire capacity of the system. In September last year, there were almost 580,000 NGVs operating in Colombia.